Mac got drunk, went podcasting, and opened up...way too much. It's New Orleans radio presents Happy Hour - a podcast filled with booze. Last week, Mac went on the air with Grammy-nominated musician, Andrew Duhon, and a few others to discuss life, bodypainting, and movies. Check it out below! Listen to Mac Alsfeld and Scene Magazine's Micah Haley discuss Will Ferrell and Kevin Hart's new comedy "Get Hard." There's also a little "Father-Like Son" love in the beginning. Watch Mac Alsfeld's Red Carpet Interview at the TCFF! Moments before "Father-Like Son's" Midwest Premiere at the Twin Cities Film Festival. Buy Your Tickets to the Twin Cities Film Fest! Click on the image above for ticket information. With Benedict Cumberbatch's "The Imitation Game," Reese Witherspoon's "Wild," and Jason Reitman's "Men, Women, and Children" playing at this year's Twin Cities Film Festival, this is certainly one of the biggest film festival's that "Father-Like Son" has ever been a part of. Come join in support of your favorite father/son duo! "Father-Like Son" Takes 2nd Place at HWY 61 Film Fest! "Father-Like Son" takes 2nd Place in the Feature Comedy category of the Highway 61 Film Festival! This marks our second win and our 11th national film festival! FLS is an Official Selection to the Twin Cities Film Fest! Click the laurel above to purchase your tickets! "FLS" an Official Selection to the Laughlin Intl. Film Fest! Be sure to purchase your tickets for next Friday's screening of "Father-Like Son" below. "Father-Like Son" Official Selection to the Rome Intl. Film Fest! "Father-Like Son" is an Official Selection to the 11th annual Rome International Film Festival in Rome, Georgia. It will take place from September 4-7th. For more information, click the laurel below. 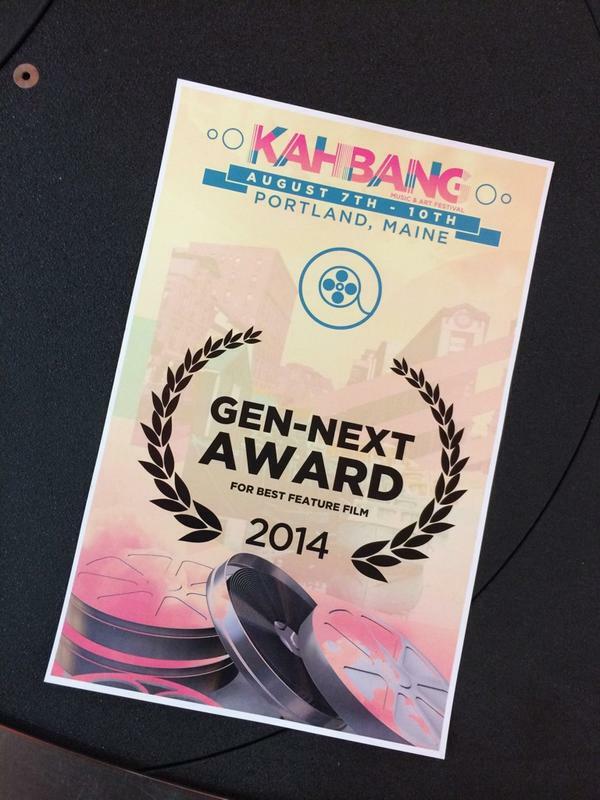 "Father-Like Son" Wins "Gen-Next Award" for Best Feature at KahBang! The Abby Normal boys won the Audience Award for the 48 Hour Film Project, the overall Best Film in the New Amsterdam "It's Your Town" national ad competition, and the "Gen-Next Award" for Best Feature at the KahBang Film Fest! It was truly remarkable to be up in Maine for KahBang. We highly encourage everyone to submit here, as the hospitality was out of this world. We loved every second of it! Buy Your KahBang Film Fest Tickets Today! Click the image below for your once-in-a-lifetime chance to view this film alongside DMX! "Father-Like Son" Actress Featured on Mashable Front Page! Check out this amazing article on why New Orleans may just be better for the film industry. It has an amazing piece on our very own Jennie Kamin with a gorgeous writeup by Travis Andrews. Check it out - here! Click the photo for a link to the article! FLS an Official Selection to the KAHBANG Film Fest!! It gives us great joy to announce that we'll be taking "Father-Like Son" to one of the coolest film festivals in America - Kahbang Film Fest! It's an outrageous 4 day music, arts, bbq/silent disco, film festival in Banghor, Maine. Some of the past musical acts include Chromeo, Earl Sweatshirt, Lupe Fiasco, Matt & Kim, Dr. Dog, etc. ***DMX HAS JUST BEEN ANNOUNCED TO PERFORM*** DOGS WILL BE BARKING! August 7th-10th - Come with us! Get cooler badges! CLICK ME SOFTLY! What did the five fingers say to the face? MICHIGAN! The boys from the boot are going to the hand-shaped state at this year's Waterfront Film Festival in South Haven, MI. Check out the schedule here, and purchase some tickets already, damnit! "Father-Like Son" to Kick Off Indywood's Local Film Week! New Orleans' brand-new Indywood Theatre is kicking off a 'Local Film Week' with "Father-Like Son." In true Big Easy fashion, the theatre is a BYOB theatre, and the FLS guys will host a no holds barred Q&A after the Thursday night screening. Seating is extrememly limited (30 seats) so get your tickets fast! FLS & The Chattanooga Film Fest Nearly Underway! Local Chattanooga Paper Sings Praises for "Father-Like Son"
Catfish getting' some love from the home crowd! "Father-Like Son" Officially Selected to the Chattanooga FF! On April 5th, 2014, "Father-Like Son" headlines the CFF Respects Comedy Block alongside indie hit - "Cheap Thrills." "We're just really glad to be here at the Oxford Film Festival."